Thanksgiving Holiday is much more than just a feast of turkey and the Thanksgiving Day parade. You should know the amazing facts about the history of this holiday that we celebrate every year. In the United States, Thanksgiving Day is celebrated on the fourth Thursday in November, while Canadians celebrate this holiday on the second Monday of October. Thanksgiving holiday is celebrated in order to commemorate a feast that was held in 1621 by the Pilgrims and the Native Americans at Plymouth, Massachusetts. Thanksgiving Day starts the most exciting festivities of the year. In early October 1863, President Abraham Lincoln issued a ‘Thanksgiving Proclamation,’ and officially chose the last Thursday of November for Thanksgiving Day. Since some years have four or five weeks in November, President Franklin D. Roosevelt officially set aside the fourth Thursday as the national day for Thanksgiving. The Congress approved his declaration a few years later. You may have been told the history of Thanksgiving before, and you will agree with me that it is one worth sharing again and again. Experts estimate the first Thanksgiving to 1621 when religious refugees from England (referred to as the Pilgrims) extended an invitation to the neighboring native Indians (the local Wampanoag tribe) to feast with them after a fruitful harvest at the Plymouth Plantation in Massachusetts. It is worth noting that the Pilgrims believe that such a bountiful harvest calls for merriment as it is never an obvious thing. Thanksgiving feast lasted three days—people loved to party “hard” during that period. Just as before, Thanksgiving Day is still all about feasting with family and friends, and being thankful for a bountiful harvest, which may be literally or figuratively. The introduction of flowers makes Thanksgiving a very special holiday. 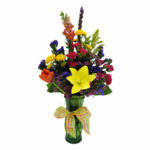 In addition to transforming your table and home into a masterpiece, flowers make perfect thoughtful Thanksgiving gifts. 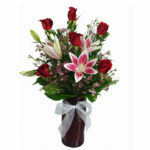 As with all kinds of special occasions, flowers make Thanksgiving more unforgettable and beautiful. In fact, the Thanksgiving table is incomplete without a gorgeous fall-inspired floral centerpiece or cornucopia (horn of plenty) in orange, red, burgundy, and yellow—the colors of autumn. Aside from transforming your home or your tablescape into a masterpiece, they also make tasteful and thoughtful Thanksgiving hottest gifts. If the Thanksgiving centerpiece is harvest-inspired, people incorporate edible arrangements with berries, vegetables, or fruits. Turkeys see up to 260-degree angle of view with their eyes. Only half of the Pilgrims who sailed on the Mayflower lived to celebrate the first Thanksgiving ceremony held in 1621. Out of 150 people (50 Pilgrims and 90 Wampanoag Indians) who attended the Thanksgiving ceremony, only five women were present. Benjamin Franklin wanted turkey to be the national bird of the US. Thomas Johnson opposed the idea. He even nick named the male turkey “tom” in order to piss Franklin off. The annual Macy’s Thanksgiving parade tradition started in the 1920s championed by the first-generation immigrant employees of Macy’s. This celebration was linked to the traditional festivals of their homelands. Turkey was not in the menu in the first Thanksgiving ceremony. The menu included duck, goose, venison, oysters, eel, fish, and lobster. California is the largest consumer of turkey in the US. Sarah Joseph Hale, the writer of “Mary Had a Little Lamb” convinced Abraham Lincoln to make Thanksgiving a national holiday after writing him letters for about 17 years. 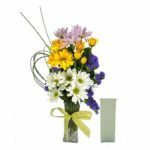 If you suffer from allergies, there is no need to worry because the pollen can be removed from these flowers. Not only does this benefit your allergies, but it also prevents any potential mess from the pollen falling onto the table below. Stargazers are not only loved for their beauty, but also their sweet scent. Their smell is quite strong and has a way of filling a room. Stargazers are a long lasting flower. They can last upwards of 2 weeks as the old blooms die, cut them off to promote the other blooms. Since the flowers rely so much on nutrients, you must make sure that you add flower food to the water. This helps regulate bacterial growth as well as providing the flowers with extra nutrients. 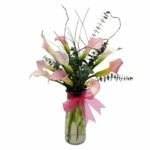 The flowers of Stargazer lilies are large, growing to be 6 to 12 inches in diameter, and they grow towards the sky, appearing to gaze upwards. 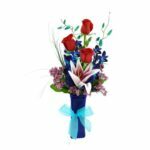 Spray roses are usually referred to as sweetheart roses. We usually call the sharp spikes on the stem of a rose bush “thorns“. But these are in fact technically prickles. 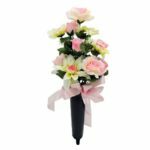 Spray roses usually have 3 to 5 blooms per stem. Spray roses come in most of the same colors as single bloom roses and have lots of the same traits. Dahlias are the national flower of Mexico because that is its native habitat. Dahlias grow from tubers in the ground, just like potatoes. 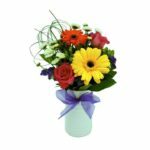 Gladioli “Glads” are also called sword lilies because of their sharply pointed leaves and tall stalks of flowers with pointed tips. The Latin name for Gladiolus is gladius, a clear reference to the sword-swinging gladiators of ancient Rome. Gladiolus is the official 40th anniversary flower.